But of course the story was true. At around 6:30 PM on Monday, March 24, 1980, a red VW Passat drove up to the small, graceful chapel of the Divina Providencia Hospital, a center run by Carmelite nuns where Romero lived. It was, as it almost always is in San Salvador, a hot day, and the wing-shaped chapel’s doors were open. As Romero stood at the altar just after the homily a tall, thin bearded man in the back seat of the VW raised an assault rifle and fired a single .22 bullet into the archbishop’s heart. Then, in no particular hurry, the car drove away. A grainy black-and-white photograph from that day shows the victim on the floor. 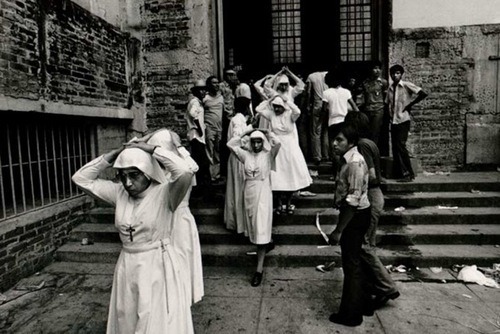 As Romero’s heart pumps out the last of its blood, the white-coiffed nuns gather around him like the points of a star, or like the figures at the feet of the Christ in Rennaissance murals, which were intended simultaneously as representations and as prayers. Historical turning points are so often the result of stupidity. The Sandinista Revolution, which had triumphed in Nicaragua barely eight months before, had set the dream of revolution flaring across Central America. But Romero’s murder, and the mayhem and bloodshed set off by a sharpshooter at his funeral the following Saturday, were perhaps the immediate sparks for the bloody twelve-year civil war that started just months later, with the US providing financial and military backing to the government side. 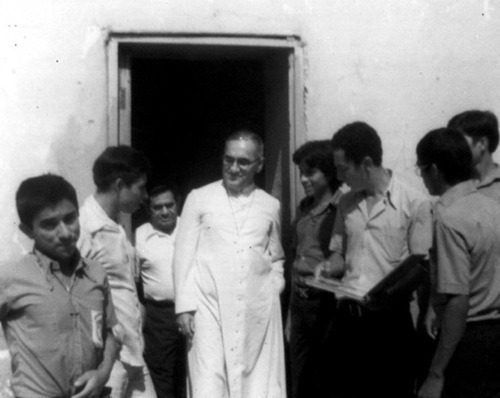 It is hard to overstate how fervently the campesinos of El Salvador believed in Romero. When he was gone, entire villages placed themselves at the disposal of the guerrilla factions, which came together as a united front, the FMLN, a few months later. 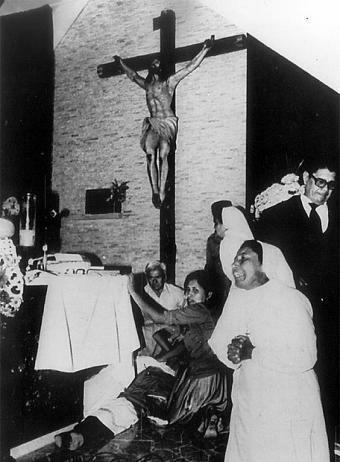 During the presidency of General Arturo Molina (1972–1977), the army and security forces were essentially transformed into death squads: Romero watched in horror as campesinos in his parish were displaced, threatened, terrorized, and, increasingly, shot, stabbed, or hacked to death by underfed, underage soldiers wielding machetes against their own kind. He began speaking out against these atrocities and received his first death threat (from General Molina himself, who wagged a finger at him and warned that cassocks were not bullet-proof). And then, in 1977, just weeks after Romero had been ordained archbishop, the Jesuit priest Rutilio Grande, a close friend of Romero’s who had been organizing landless peasants, was shot down on a country road along with two of his parishoners. Around this time, I made many trips to the countryside. But it was only two years later, after Romero’s funeral had dissolved into grim chaos, that I had my first real understanding of the feudal ignorance in which Salvadoran campesinos were kept. As red-robed cardinals from abroad milled around the vast unfinished cathedral together with humble worshipers who had lost their shoes, their false-teeth, their satchels or their eyeglasses in the stampede to escape from a sniper’s bullets, everyone trying to understand what had happened, and why, a tiny, trembling man approached my friend, the photographer Pedro Valtierra. “Please, my daughter’s lost.” he said, and then he repeated several times, until we understood: “Please use your loudspeaker to call out her name.” He was pointing to Valtierra’s camera. Those were the days before the Internet or even faxes, and the lone opposition newspapers, El Independiente and La Cronica del Pueblo, were more or less gagged. The murders and disappearances carried out by death squads, army officers, and a notorious security force called, for inexplicable reasons, the Treasury Police were unreported, but Romero took to reading a detailed account of the week’s brutalities. The sermons were broadcast over the Catholic radio station, and campesinos all over the country gathered around a radio to listen to them. So did the military. Thanks to an extraordinary reportage posted last month on the Salvadoran online newspaper El Faro we know that the tall, skinny shooter who killed Romero was contracted by General Arturo Molina’s son, while the weapon and the getaway car were provided by the drinking buddies and death squad associates of a former Army major called Roberto D’Aubuisson. Not that anyone doubted from the moment it happened that the murder was D’Aubuisson’s work. He died of cancer of the esophagus at the age of forty-seven, in 1992, but while he lived, this slender, charismatic psychopath was king. Although he was briefly arrested, he was never tried for murder, and soon rose to become the head of the Constituent Assembly; he was defeated only narrowly when he ran for President in 1984. Until last year, the party he founded, which had its origins in the death squad he also put together, governed El Salvador. Over a two-year period El Faro’s director, Carlos Dada, hunted down and twice interviewed one of the surviving participants in D’Aubuisson’s conspiracy against the Archbishop, a former Air Force pilot by the name of Álvaro Saravia. Four other alleged co-conspirators named by Saravia have been killed, another committed suicide. Some, like, Mario Molina, son of former President Arturo Molina, are enjoying the good life, but Saravia, pursued by his own demons, is living in abject poverty in another Latin American country not disclosed in the newspaper’s report. Perhaps out of sheer loneliness, he told his story to El Faro. Saravia recounts the details about the hit man and Mario Molina’s role in hiring him. He also reveals that an announcement placed in La Prensa Grafica by Jorge Pinto, the owner of the independent newspaper El Independiente, inadvertently sealed Romero’s fate. Published on the morning of March 24, it informed readers that the archbishop would celebrate a Mass in memory of Pinto’s mother at 6 PM that afternoon, in the Divina Providencia chapel. Hung over after a party with other members of D’Aubuisson’s group, Saravia woke to the news that the boss had ordered Romero’s murder at this conveniently secluded location. Karol Wojtyla had been anointed pope in late 1978, and with the assistance of then-Cardinal Joseph Ratzinger he was busy dismantling the progressive church of Latin America. Pope John Paul II’s response to the crime—he called it “a tragedy”—was hardly as emphatic as his attacks on the pro-Sandinista clergy when he visited Nicaragua four years later. A spontaneous movement in favor of Romero’s canonization has been stalled for years now in Rome. The day before his murder, on Sunday March 23, after a cropduster had sprayed insecticide on a protest demonstration, and we reporters had gone nearly mad from the obligation to hunt every morning for the mutilated corpses that D’Aubuisson’s people had left at street corners the night before, and distraught mothers lined up every day outside the archbishopry’s legal aid office asking for help in finding their disappeared children, and the waking nightmare of El Salvador clamored to the very heavens for justice, Óscar Arnulfo Romero for the first time spoke in exclamation points during his Sunday homily. Monseñor: The Last Journey of Óscar Romero, a film directed by Ana Carrigan and Juliet Weber.